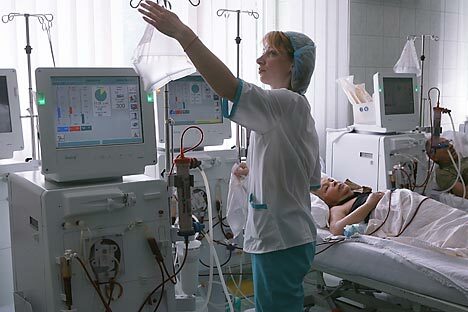 According to the Ministry of Public Health and Social Development, Russians can obtain at home most of the same aid available on the global healthcare market. As it was decided in the Soviet era, the unfairness in access to medical services could be avoided by the total abolition of payments for them. Soviet medicine achieved tremendous success in the initial stages, owing to ensuring mass access to medical services for the people: Many infective diseases were killed, the number of TBC patients dropped off, and epidemics were brought under control. However, Russian free healthcare slowly turned doctors from a well-to-do elite into employees of medical "plants and factories." Deprived of earning possibility, medical institutions were dependent on the state budget and not sufficiently financed. As a result, money for medical research was tight, and guarantees of patients' rights were virtually absent. A patient's right to get information on his/her health status, to make an informed decision on the consent to or refusal of treatment, as well as to the medical secret—i.e. non-disclosure of information on his/her health status to third parties without patient's consent—are principle patients' rights protected by law in the majority of developed economies. Alexandra's father caught lung cancer in the late 1970s. At that time, the physician in charge was not obliged to inform the patient of his/her real diagnosis, but could advise his/her relatives of such a diagnosis without the patient's knowledge. "Let him live as long as he can," the doctor said, and Alexandra and her mother supported the decision made by the doctor to provide no treatment. Alexandra's father died in a year and never knew his diagnosis, although he may have guessed it. Soviet patients also had no right to select their out-patient clinic or hospital, even for money. Registration determined the allocation of patients to a specific healthcare facility. Serious patients could have been sent to a higher level hospital, but only by a residential hospital's referral. Applying to the doctor of your choice, just having paid money, was impossible. It became clear in the late 1980s–early 1990s, when Russian public health reforms started, that money is a fairer method of benefits distribution than any other. However, after paid healthcare was introduced, free healthcare was not canceled. Having passed a new public health law in 2011, Russia set priorities clearly once again: Free medicine is basic, while paid healthcare is additional. The abolition of free healthcare would be a terrible injustice to low-income Russians—especially the elderly. Lyudmila is an elderly citizen. She held an executive office in the past, took long-term business trips abroad and amassed considerable savings, in terms of Soviet standards. Lyudmila's husband passed away 10 years ago; they had no children. Then Lyudmila discovered that she had cancer. Lyudmila likes free healthcare. "I'm treated absolutely for free in the in-patient department, and even with a full board. When I'm unable to stand up, nurses and nurse's aides tend to me, and also for free. You can do totally without relatives' help in the hospital," she says. "The difficulty I faced happened when I was discharged from the in-patient department after the regular treatment course. According to Russian standards, the payment for drugs domiciliary is not covered by free guarantees of treatment. I have obtained disabled-person status and am entitled to a small pension bonus for drugs. But the money is still tight, and I can't even imagine how those with no savings at all can survive!" says Lyudmila. Svetlana deals in fur clothing and is very rich, but she had a cancer diagnosis handed to her at the age of 40. "I will never go to a free doctor!" Svetlana says confidently. "And if I did, I would not be alive, likely." Svetlana hardly trusts even paid physicians in Russia. "I went to Israel for treatment. The medicine is expensive, but the spirit is completely different: Cancer is considered curable, rather than a death warrant as here in Russia. It's just very hard to deal with oncologists in Russia psychologically." Svetlana is not alone in her distrust of domestic free healthcare. Many Russians seek to go abroad for treatment, as she did. Medicine in Russia, however, has made progress driven by reforms. According to Ministry of Public Health and Social Development estimates, Russians can obtain at home most of the same aid available on the global healthcare market. Should healthcare providers in Russia still lack necessary treatment techniques that are already in use in foreign clinics, treatment abroad is possible even at the expense of the Russian healthcare budget, after the acquisition of appropriate certificates. Furthermore, patients' rights are specified in Russia by law, thanks to reforms: in particular, the patient’s right to information on his/her health status; the right to an informed voluntary consent to or refusal from medical intervention; the right to medical information confidentiality; and the right to select a physician and a medical entity.